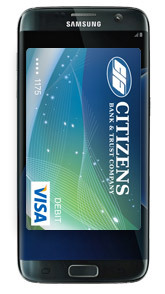 At Citizens Bank, we take pride in offering you innovative ways to access your money. We are pleased to be one of the only banks in the area to offer Samsung Pay™. Simply add your Citizens Express Visa debit cards to Samsung Pay on the newest Samsung Galaxy devices. You’ll be ready to shop nearly anywhere you can swipe a card. To find out more about Samsung Pay, read our Frequently Asked Questions. ©2016 Samsung Electronics America, Inc. Samsung, Samsung Pay, Samsung Galaxy, Samsung Knox, Galaxy S, Samsung Galaxy S6, S6 active, S6 edge, S6 edge+, and Note5 are trademarks or registered trademarks of Samsung Electronics Co., Ltd. Use only in accordance with law. Other company and product names mentioned may be trademarks of their respective owners. Screen images are simulated; actual appearance may vary.